An advanced satellite with radar sensors Israel launched into space earlier this month is expected to enhance surveillance of the two greatest threats to Israeli and international security: Iran's nuclear program, and the extensive Iranian terrorist arms smuggling network. The SAR (Synthetic Aperture Radar) satellite, called Ofek (Horizon) 10, creates high definition, radar-generated images, that look as if they've been taken by an optical camera. As it circles the Earth every 90 minutes, it can hover over several targets, peering through all weather conditions to beam back data to Israel's Military Intelligence Directorate. Once it becomes fully operational, it will assist Israeli efforts to catch any Iranian nuclear transgressions. This development comes as defense officials in Jerusalem continue to warily follow diplomatic negotiations between an Islamic Republic that has reached nuclear breakout status, and an international community that may, according to Israeli fears, lack the resolve to force Iran back from its nuclear advances. The Ofek 10 spy satellite soared into orbit on board a Shavit (comet) rocket, produced by Israel Aircraft Industries (IAI). The latest launch, which was overseen by the Israeli Defense Ministry's Space Administration, means that Israeli intelligence can now fall back on several spy satellites to create one rolling evaluation of targets of interest, Amnon Harari, who heads the Space Administration, said this month. 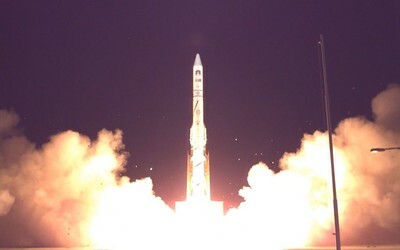 Israel designed the satellite to be able to maneuver easily over multiple targets, meaning that Military Intelligence operators can direct the radars not only at nuclear sites in Iran, but also at ongoing Iranian efforts to smuggle powerful weapons, including missiles and long-range rockets, to terrorist proxies such as Hizballah in Lebanon and Islamic Jihad in Gaza. Israel's intelligence agencies divide their time between watching the Iranian nuclear program and working to disrupt the arms smuggling network, in a covert campaign that sees frequent, yet classified, successes. The nuclear program and the arms-to-terrorists program are interlinked threats. The former, if completed, would enable Iran to threaten Israel and Sunni states with mass destruction, and the latter already enables pro-Iranian terror groups to do Tehran's regional bidding and sow radicalism and instability. If Iran went nuclear, its terrorist arms program could serve as a potential delivery mechanism for a dirty bomb that could be deployed anywhere in the world. As a result, Israel is heavily investing in upgrading intelligence capabilities. Ofer Doron, who heads the IAI's Mabat Division, which develops space systems, said the new satellite has "an incredible ability to take photographs, and it is very small." The Ofek 10 can provide very precise, high quality images under all conditions, he added. Defense Minister Moshe Ya'alon alluded to the satellite's future role against Iran's conventional and unconventional proliferation activities when he stated that it would enhance Israeli capabilities to deal with threats "near and far, at any time of the day, and in all types of weather." "This is how we continue to consolidate our enormous qualitative and technological edge over our neighbors," Ya'alon said. Although Israeli officials have decreased the number of public statements expressing concern over the Iranian nuclear program, the issue remains at the top of the national security ladder in the eyes of the military and government, and considerable resources are being invested quietly to cope with the program. Those efforts include ongoing refinements to a military strike option in the event that Iran is caught making a secret effort to break out to the weaponization stage. The Iranian arms network represents the largest known program of state sponsorship of terrorism. It reaches far beyond Gaza and Lebanon, and includes Shi'ite militias and pro-Iranian terror groups in Syria, Iraq, Bahrain, Yemen, Sudan, Libya, Pakistan, the Far East, Afghanistan, and even Latin America, according to Israeli intelligence assessments. Iran is also facilitating the arrival of thousands of Shi'ite foreign fighters into Syria, to fight on behalf of the Assad regime. Many of these militiamen may go on to form Quds Force cells when they return to their countries of origin, according to a report released in March by the Tel Aviv-based Meir Amit Intelligence and Terrorism Information Center. My esteemed prior commentor is free to express any view. I want to remind readers that without the cooperation of the US government, Israel would be hard pressed if at all capable, to perform these feats of modern magic. So I would hesitate to put down President Obama as "incompetent" and "disrespected". He has the support of over half the US population, has kept the US out of unnecessary wars, stopped the lying about WMD's, and enabled the US economy to recover. All this notwithstanding a deliberate obstructionist policy by the opposition, obstructionist to the point of disloyalty to the country and We The People. This is good to hear but not surprising given Israel's determination to remain self reliant. The U.S., my home country, can no longer be relied on for any military support and the growing level of anti-Semitism throughout the world indicates that the chance of any military support in either boots on the ground, weaponry or financial aid to be little to none. It is fervently hoped that if Israel should have to take on Iran and the Middle East on its own that the west will be forced to assist to avoid being thoroughly marginalized and humiliated; the position it now holds given the collapse of foreign policy under a President that is totally incompetent and disrespected at home and abroad. Not to mention that he has made it no secret that his preferred alliance is with the Mullahs. Best wishes to Israel but this is an awful lot of weight on this fierce but tiny nations shoulders; the only true democracy in the Middle East, surrounded by malevolent neighbors who hope to swallow it whole.